Working with the Royal Manchester Children’s Hospital Charity, we raise funds to continue providing the best possible care for children taking part in our research. If you would like to support the work we do, there are several ways in which you can make a donation. From raising sponsorship by taking part in sporting events, to making a one-off contribution, we are very grateful for any amount. To find out how you can help, please visit the donation pages of the Royal Manchester Children’s Hospital Charity website. Please make it clear when you donate to the charity that you would like your funds to go to the children’s clinical research facility. If you are donating online, please specify this in the comments box on the online giving form. We are also grateful for donations of old toys, computer games and DVDs for the facility. 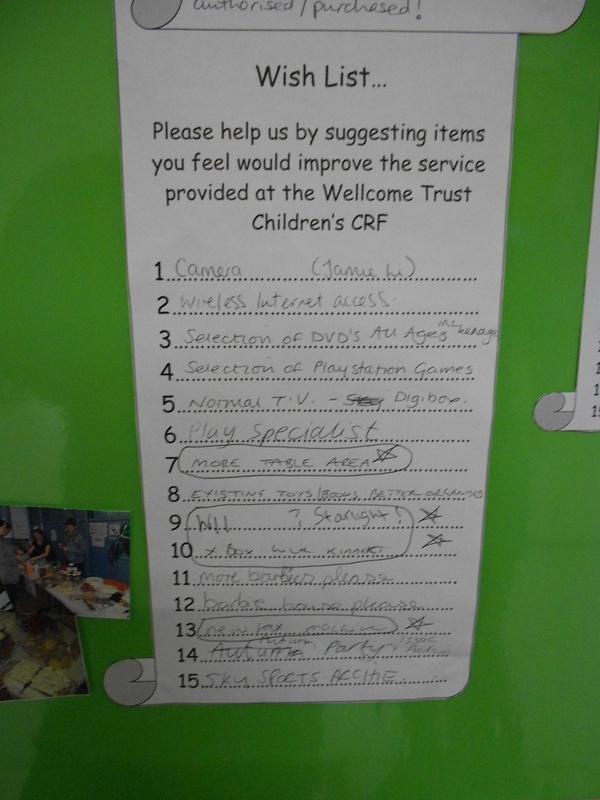 To help children feel more comfortable at the facility we encourage them to add items they would like to play with on to our wish list (below). If you would like to donate any items on the list email us using the subject heading as children’s clinical research facility wishlist. If you have any queries about making a donation, please get in touch with the charity team.